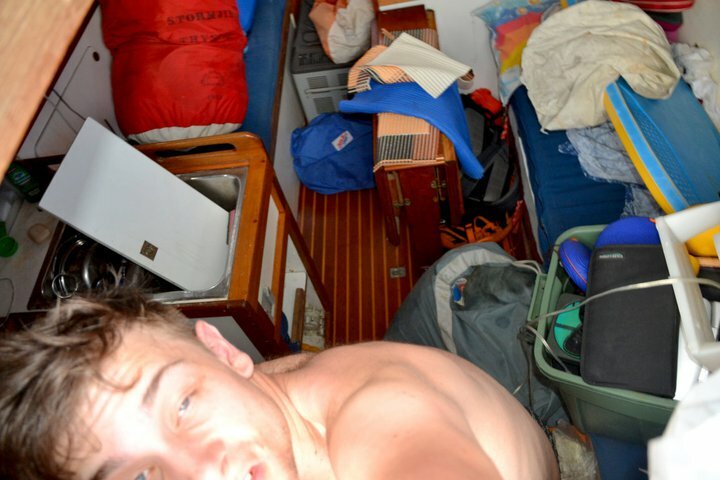 Two and a half years ago we stepped foot on a fully equipped and almost overloaded Marianne. The first few days we actually spent clearing out everything we (thought we) wouldn’t need. In order to fit all of our own stuff on marianne, such as cello, guitars, microphone stands etc., we had to get rid of non-essential items such as extra towels, kitchenware, movies, books, random stuff, and a sewing machine (which we really missed later on while sewing and fixing our sails numerous times by hand). Not really with specific intentions (especially when bearing in mind that we are two peace-loving army draft resisters), but more due to curiosity, we left the collapsible baton on board. During our trip, this appliance kept moving to lower layers of our chaotic storage, until we had finally completely forgotten about it. And just like everything else, it began to rust and rot away. Chaos on our first day on board. Recently, after having spent five weeks on the open water, we finally arrived in Rio. We felt pretty comfortable and welcome in this big city and had found a nice place for Marianne at a marina almost in the city center. Walking distance 5 minutes from suburb Santa Teresa or Lapa. Only five minutes and a stroll through the park and we were at the heart of this city, with live music acts and huge caipirinhas on the street for about 2 US dollars a glass. On a rainy afternoon I was talking to my sister online and while I was enjoying a delicious Skol beer, she told me exactly how dangerous Rio actually is. I just replied with a “Oh, I hadn’t really noticed”. 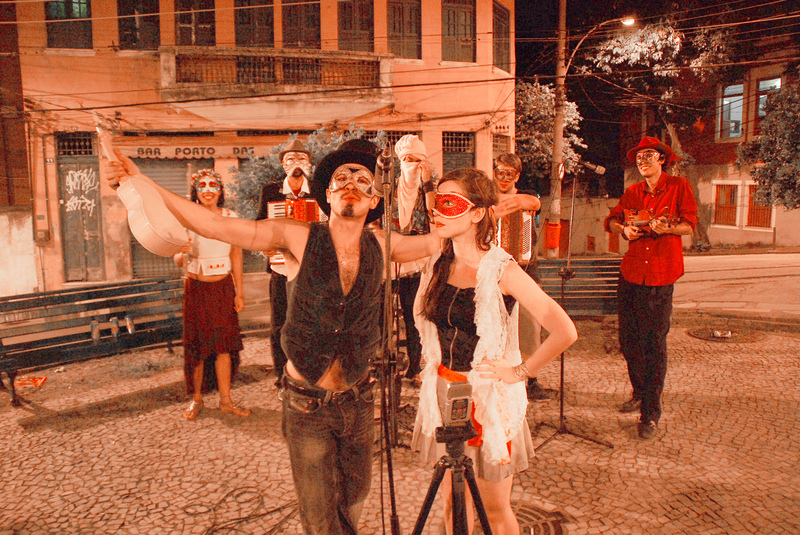 And so another 3 wonderful weeks passed in which we recorded the Trupe Dos Errantes and walked all over the city to find interesting musicians and to explore the great arts and different cultural sides of Rio. Our naive trust continued to reward us with great encounters, fun nights, and rockin’ recording sessions. Trupe Dos Errantes in Rio. After a long and late recording session at Fernandos place (musician of “the” Trupe), we managed to miss our bus stop and had to get off a couple hundred meters further down the road. So we walked back, just chatting away at around midnight on the main street. And that’s where it went down. All of a sudden we didn’t feel that welcome anymore in the host country of the next football (soccer) world cup. The nice little park had turned its back on us and started to reveal its daker sides. Two fellas had the great idea of stealing a little cash from us. It all ended with my t-shirt getting ripped and that was basically it. The next day, two old men equipped with kitchen knives wanted whatever we had in our pockets. Again, we got away with just handing them some change. So with these events on our minds, the next time we knew that we would return home relatively late, Ben strapped the old collapsible baton to his belt and off we went. And who would’ve thought: right before entering the park, a black car with tinted windows cut us off with squeaking tires. We had our cameras and other precious equipment in our backpacks. Two big guys got out of the car and ripped my bag with beers and groceries from my hands and went for our equipment, but then a sudden single strike with the baton caught them by surprise. It did the trick: the two guys rushed back into the car and off they went into the dark of the night. The homeless guy watching all of this starting collecting the potatoes that we had lost. The day after being mugged. Luckily just the shirt was ripped. Never had I felt this safe and sheltered as we were on our boat and on our way onto the open water. The open water sometimes really is our best friend. We have now arrived in Salvador, and even though I already experienced how our friend Frank got his phone stolen while talking on it, I am still happy to let you know that we will be recording inspiring musicians here for a good two weeks! South America – here we are!